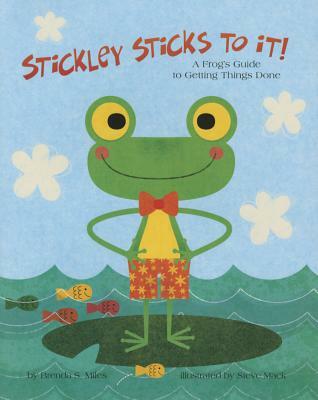 Stickley the frog has the gift of stick-to-it-ness, or perseverance: the ability to stick with tasks and see them through, no matter how frustrating or challenging they may be, even when good results are not guaranteed. Perseverance is an important skill to learn, because getting things done at home and at school helps children achieve goals and feel proud. Includes a Note to Parents, Caregivers, and Professionals with more information about perseverance and strategies for nurturing stick-to-it-ness in kids. Brenda S. Miles, PhD, is a pediatric neuropsychologist who has worked in hospital, rehabilitation, and school settings. She is an author and co-author of several books for children, including The Moment You Were Born: A Story for You and Your Premature Baby, Stickley Sticks to It! : A Frog's Guide to Getting Things Done, Chicken or Egg: Who Comes First? and Princess Penelopea Hates Peas: A Tale of Picky Eating and Avoiding Catastropeas. Brenda encourages children of all ages to dream big, find joy, and embrace adventure.Steve Mack is a freelance illustrator and has been illustrating professionally for the last decade. Steve has recently returned to Canada and his freelancing roots and now works for many clients. He has a small studio on a farm in the valley and lives with his wife and two small children. His children's books include Stickley Makes a Mistake, Peanut Butter & Jellyous...sometimes friendships get sticky, and The Grouchies. Visit him at www.stevemack.com or follow him on Facebook: @SteveMackIllustrator, Twitter: @steve_mack or Instagram @SteveMackIllustrator.